Industry leader RETIF already knew the value of utilizing voice in its picking application — the wearable voice-picking solution that had been in place since 2006 had provided a 10 percent increase in the productivity of the warehouse picking workforce as well as a significant reduction in errors. The original solution had already been replaced in 2010. In 2014, the devices were ready for replacement again. As RETIF began the process of selecting a new device, several issues led to the identification of new device criteria. 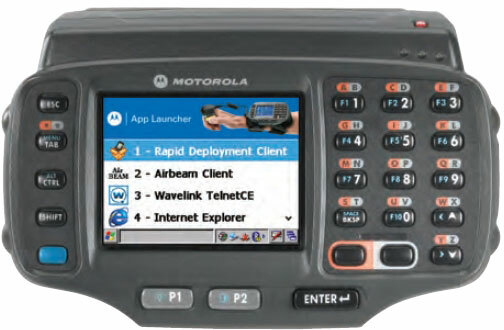 The TekSpeech Pro multi-modal picking solution and the WT41N0 wearable mobile computers from Zebra Technologies were chosen as the next generation solution, since VoCollect could not satisfy the new criteria. The current speaker-dependent hardware required every user to spend a minimum of 30 minutes training the device to recognize his or her voice. In order to accommodate accents, voice speed and more, users needed to repeat a list of 50+ words multiple times. The company wanted to switch to a speaker-independent solution that would eliminate the need for users to train the software for their specific voice — but Vocollect did not offer a speaker-independent option. While pure voice input had served the company well, RETIF realized that adding a display would help further streamline the picking process for a multitude of reasons. Some users weren’t comfortable with voice only. The ability to read the information on screen would not only provide the versatility to meet the needs and preferences of the entire picking workforce, it would also help users become more comfortable with voice commands more quickly, reducing errors as well as the learning curve. Exception processing procedures were challenging. Users were forced to remember which sequence of words were required to delete or change an item. A touchscreen would give users the flexibility to complete exceptions with a few taps on the screen or the press of a few keys on the soft keyboard. In addition, while the existing voice-only devices did a great job, they could only be utilized for one thing — voice picking. The company was interested in a multi-function device that could improve other warehouse processes. For example, bar code scanning would allow users to process incoming and outgoing shipments faster and more accurately. In addition, additional functionality would improve device utilization — and provide a faster return on investment. But the mobile devices available from the current provider didn’t offer this flexibility.